New Nissan Juke Revolt dan Facelift 2015 telah diluncurkan 12 Februari 2015 yang lalu dan kini telah dapat dipesan di Dealer Nissan Jakarta. 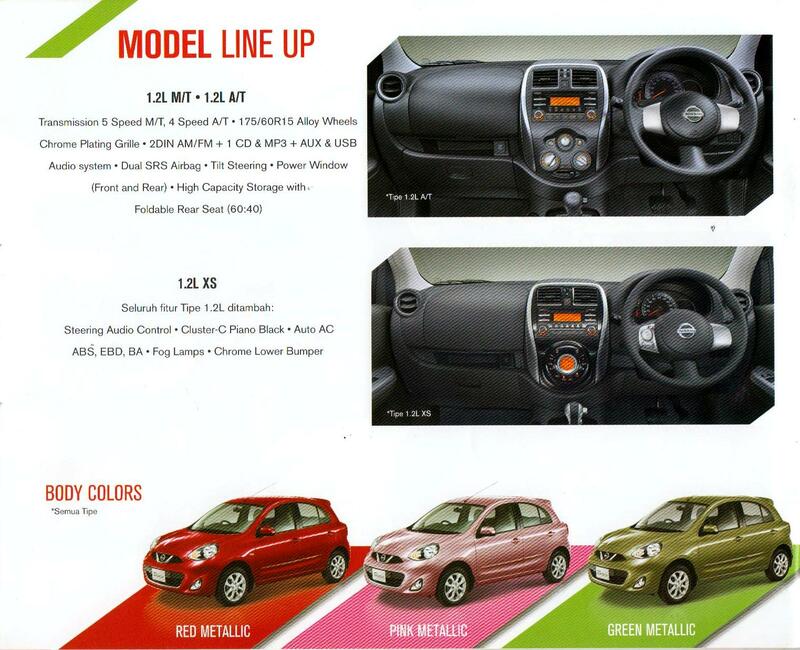 Semoga Artikel dibawah ini dapat menambah informasi bagi yang Anda ingin tahu spesifikasi serta perubahan apa saja yang ada di Model Baru dari New Nissan Juke Facelift dan Revolt 2015. AutonetMagz.com – Akhirnya PT. 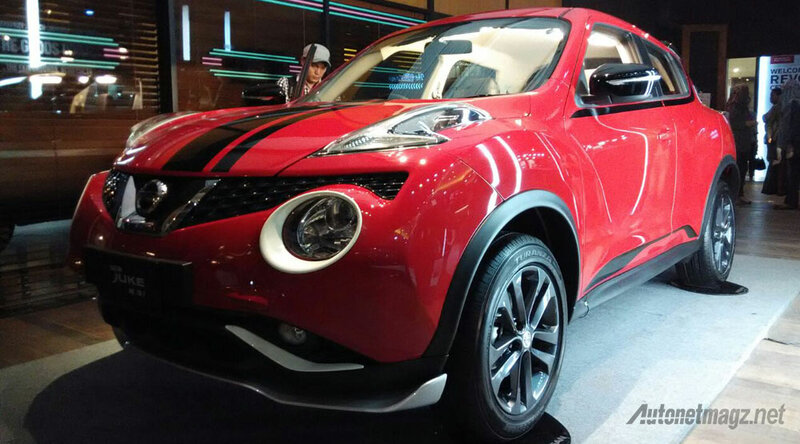 Nissan Motor Indonesia menyegarkan kembali crossoverandalan mereka, Juke. Kini Nissan Juke Facelift 2015 sudah hadir sebagai tanda kalau Nissan tak ingin tergeser oleh rival-rivalnya sebagai salah satu crossover favorit di Indonesia, terutama setelah Ford EcoSport dan Honda HR-V merangsek masuk ke kelas yang sama dengan Juke. Seperti yang sudah kami beritakan, Juke terbaru memiliki ubahan tampilan berupa bumper baru dengan aplikasi lip spoiler, pelek berwarna hitam dan lampu depan berdesain bumerang yang bentuknya mirip dengan kepunyaan Nissan 370Z. Kini diperkenalkan juga Nissan Juke CVT Revolt sebagai varian terbaru dan termahal dari Juke dengan sejumlah aksesoris eksterior yang lebih sporty. Eksterior Juke dan Juke Revolt terlihat lebih berisi daripada pendahulunya karena ia sudah dilengkapi dengan lensa projector, komplit dengan bohlam xenon, auto leveling dan light sensor seperti pada Ford EcoSport. Lampu bumerangnya kini diisi dengan lampu senja yang terlihat seperti LED DRL saat dinyalakan. Kombinasi baru lampu belakangnya juga cukup atraktif menurut kami. 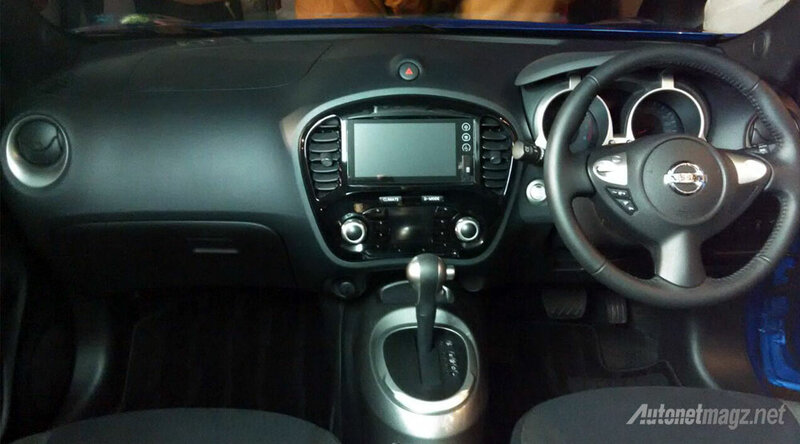 Inilah foto interior Nissan Juke CVT facelift. Secara desain mungkin tak ada perubahan signifikan, namun head unit Juke facelift kini mempunyai fitur yang lebih lengkap. Fitur baru yang dibawanya meliputi WiFi, Bluetooth, Voice Command, DLNA, Internet radio dan EZ-talk. 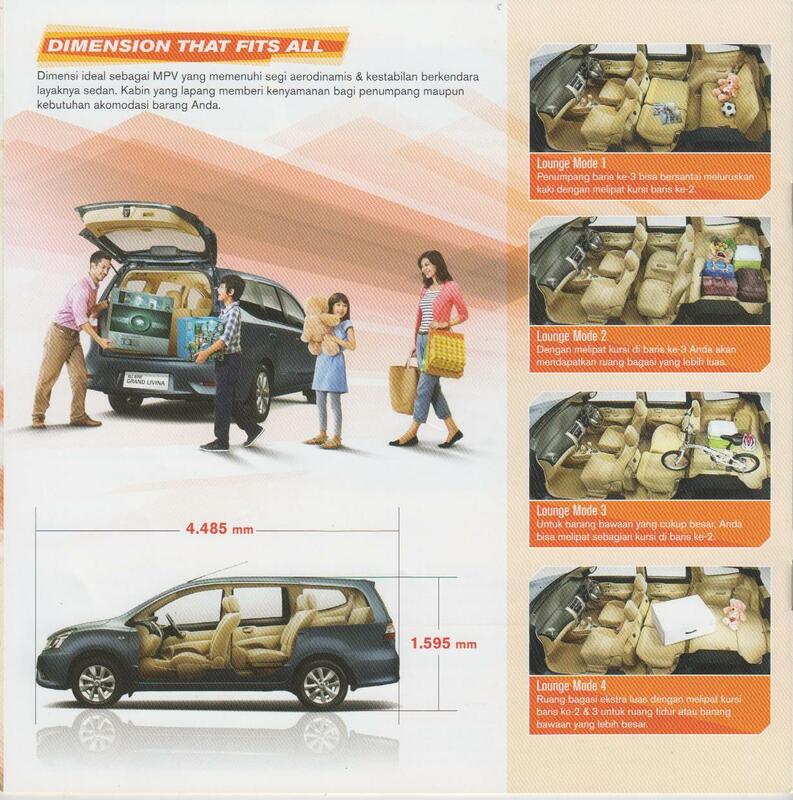 Fitur keamanan seperti dual airbags, ABS+EBD+BA dan headrest aktif sudah menjadi standar, termasuk sensor parkir di bumper belakang. Khusus varian Revolt, interiornya sudah mendapat lapisan kulit dan center console box yang juga bisa digunakan jadi armrest sebagai standar. Mirip varian RX Red Edition sebelumnya ya? Mesinnya masih sama dengan Nissan Juke sebelumnya, berkode HR15DE dengan spesifikasi 1.500 cc 4 silinder 114 PS yang sama dengan kepunyaan Grand Livina, March 1.500 cc dan Evalia. Transmisinya juga masih menjagokan Xtronic CVT andalan Nissan. Nissan memasang harga untuk Juke facelift sebesar 265, 9 juta untuk tipe CVT dengan interior hitam, lalu 274,9 juta untuk tipe CVT dengan interior merah, berikutnya untuk tipe CVT Revolt dibanderol 285,9 juta untuk interior hitam dan 294,9 juta untuk interior merah (Harga saat launching Februari 2015), yang berarti ia masih berada di rentang harga yang sama dengan pesaingnya, Ford EcoSport dan Honda HR-V (abaikan HR-V Prestige). Berikan komentar anda untuk Juke facelift ini, dan jangan lupa simak artikel First Impression Review Nissan Juke facelift 2015 yang detail dan mendalam khas AutonetMagz! 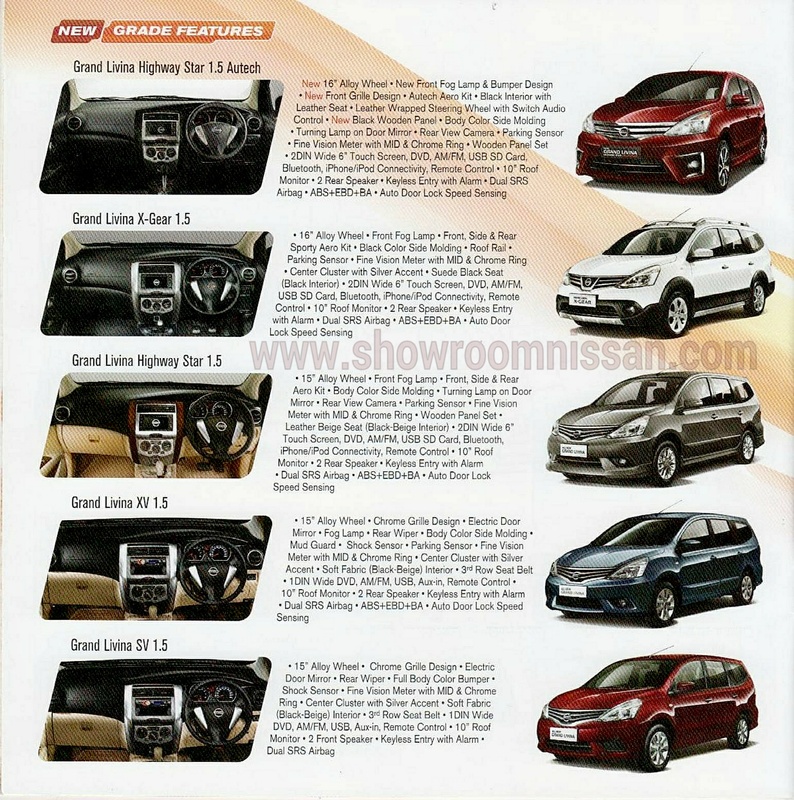 Jakarta, AutonetMagz – Finally, to response their main competitors in the CUV segment, such as Honda HR-V and Ford EcoSport, yesterday Nissan Motor Indonesia finally launched the 2015 Nissan Juke Facelift, and one new variant called the Nissan Juke Revolt. What are the differences of the new facelift version compare to the previous version? let’s find out together. Nissan Juke design always invites Pro’s and Con’s from everybody, ther is no grey area, only like it or hate it, but this time, Nissan done a good job to make the new Juke looks more appealing at the exterior. Several improvement at the front fascia, such as the new boomerang shape headlight, really gives a more fresh looks for this CUV pioneer in the world. The boomerang shape headlight now also equipped with a LED lighting effect, but too bad its basically not an DRL, due to you have to turn on the position lamp to see it glow, but overall it look like the headlight of Nissan 370Z isn’t it? nice job Nissan. For the new Revolt version, Nissan also employ a toned (Contrasting) headlights garnish, if you see, the white circle garnish around the headlight at the picture below, that is what we meant, the color scheme also different according to the car color, a white and black Juke Revolt will use a red garnish, while the red Juke revolt will use a white garnish. 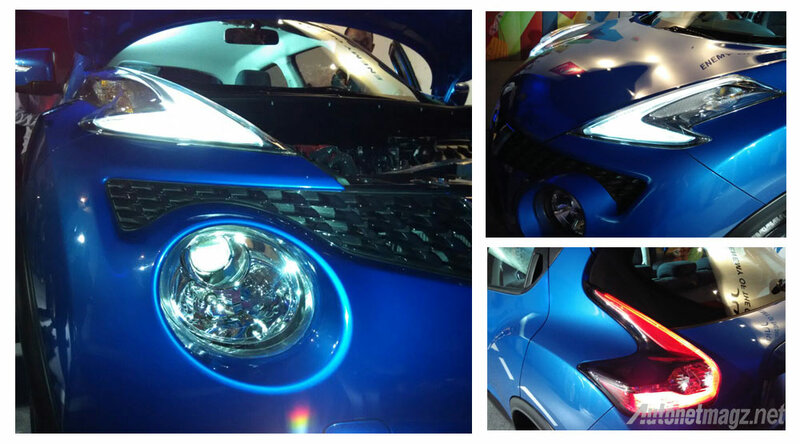 All version of Juke facelift also equipped with a Xenon projector headlight with auto leveling and auto On/Off system. The lower front bumper also change, if the previous version have several circle holes for air intake, the new facelift version employs a more sporty looks with huge air dam opening and redesigned foglamp honeycomb grille ornament. For The new Revolt version, Nissan also fitted a new front lip spoiler with grey silver color and contrasting garnish near the fog lamp, to enhance the overall sporty ambiance, and trust us, it works, the car looks more lower and sportier than before. Special for the Revolt version, you see that Nissan apply a 2 stripes striping at the hood, and the side of the body (under the window line and at the lower section of the door), to accentuate the curvy lines of the Juke, and make it look more beefy than before. For the non Revolt version, no such sticker application, so the car looks more elegant than sporty. If the previous version equipped with a side body turning indicator, in the new facelift version, the turning indicator are putted at the side mirror. For the Revolt version, the side mirror also colored by a contrasting tone (black side mirror for White and red Juke revolt, and white side mirror for black Juke Revolt) for the non-revolt version, the side mirror are colored according to the body color. The Alloy wheels design remains the same as the previous model, but special for the Revolt variant, Nissan employ a Gun Metal finish color to aligned with a more sportier design. At the rear, Nissan also changed the rear bumper with a new looks, again, special for the Revolt variant, Nissan adds a silver garnish on the bumper, to create lip spoiler looks plus a two stripes striping at the back of the car. If the previous version rear lights looks bland, Nissan adds a fine details inside the lamp lenses, they add a dark silver accent inside the lens, and Boomerang shape LED styling to make it looks more sophisticated and modern, the white rear backward lights area also changed from circle at the previous version, into a more streamlined and follow the rear lights overall styling. Special for the Red interior and Revolt Variant, a roof spoiler equipped as standard, for the Revolt version, the roof spoiler has a contrast color scheme. For the Black interior Nissan juke facelift, no spoiler are equipped, only a hood bump at the top of the rear boot. Other good news is, all new Nissan Juke Facelift 2015, are equipped with a parking camera and parking sensors combo, not like its competitor who only give parking camera, or parking sensors only. For the interior, the new Nissan Juke facelift 2015 are still similar as the previous version, by providing two types of interior scheme to choose, the Black Interior, and Red interior, who have a slight difference between each other. 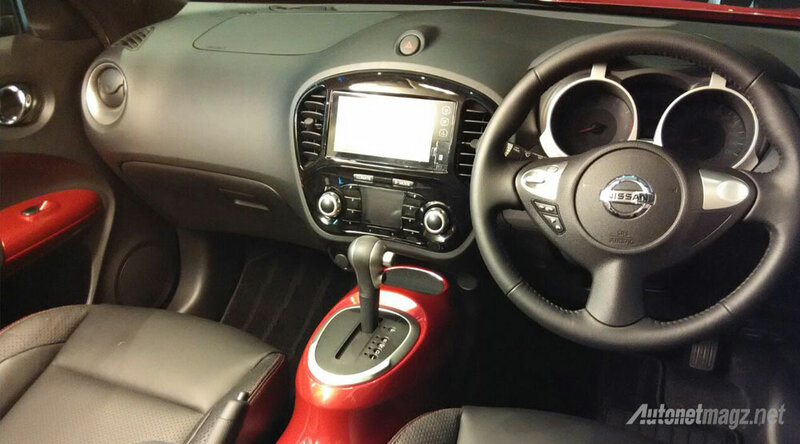 now lets start from the steering wheel, the new Juke 2015 facelift are equipped with a leather covered steering wheel with audio steering switch control and phone button. They also adds a silver accent on the steering wheel to make it look more premium. but too bad, no telescopic adjustment like its rival, only tilt adjustment available in the new Juke Facelift. Other features, such as the start stop engine button, a 7 inch detachable touch screen head unit with Android OS, WiFi ready, USB, Aux, AM/FM, Bluetooth, Voice command, with 6 speakers, and I-CON Drive Mode remains the same as the previous version, plus those features also available in both Red and Black Interior version. One of the basic differences between the Red and Black interior version lies at the red center console and red door linings. The Red interior version alos equipped with a center arm rest with console box integrated, but frankly, the build quality wasn’t that good, when we try to use it, it looks like didn’t fasten firmly, and feels like an aftermarket products. For the Black interior version, you only get a 2 cup holders and a storage at the center console. in the Red interior version, you will find a leather upholstery with red stitching accent and Juke logo embossed on the seats back while for the black interior version, a fabric seats upholstery is applied. All seats also equipped with a slide, tilt, and height adjuster for the driver side. For safety, as standard in all variant, the 2015 nissan juke Facelift are equipped with ABS+BA+EBD, immobilizer, pre-tensioner seatbelts, but no plus height adjuster for the belts, and two Airbags at the front, frankly we do expect Nissan would equipped the Juke with more safety features, such as 6 airbags, hill Start Assist, stability control or auto brake to increase its value against its competitors, but looks like they have another opinion in their mind. 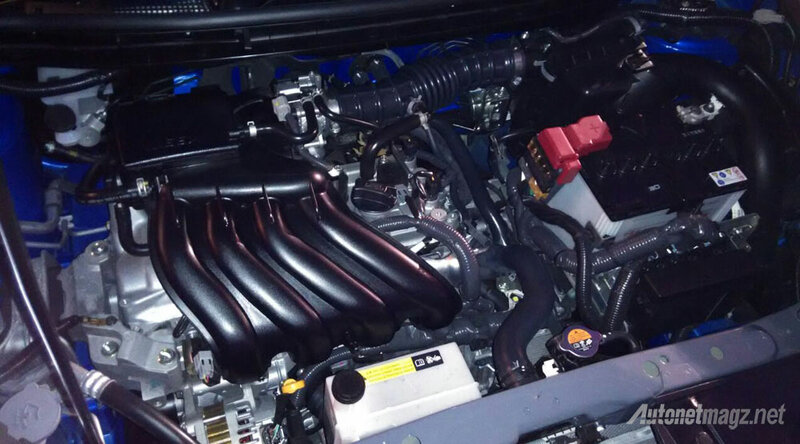 The engine remains the same, a HR15DE 1.5 liter 4 cylinder that able to produce 114 PS at 6,000 rpm and 150 Nm at 4,000 rpm, similar used on Grand Livina and Evalia. The transmission also similar, with a XTRONIC CVT and no tiptronic or paddleshift for manual mode, luckily the I-CON drive could change the car characteristics with three drive choices, Eco, normal, and Sport and increase the driving dynamic. With a new exterior and new sportier variant, Nissan try to attracts young people who dare to be different, and become the ‘Enemy of ordinary’ to buy the new 2015 Juke facelift. in terms of design, we think Nissan succeed in creating a more sporty and appealing cars, considering the Juke is entering 4 years of age. but again, this cosmetics addition didn’t hide the true problem of the Nissan Juke, which we think a little overpriced, considering, its competitor are priced at a slightly lower or similar price tag but equipped with an array of advance and useful features, such as hill start assist, auto wiper, stability control, auto brakes, etc and have more moderate design that could appeal to almost everybody. 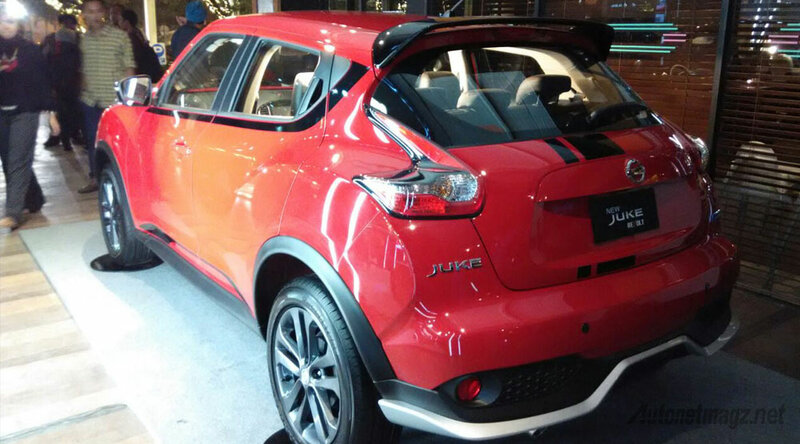 With a price tag start from IDR 265.9 million to IDR 294.9 million, we think Nissan with the New 2015 Juke Facelift will face a tough challenge ahead in the Compact Crossover (CUV) segment. 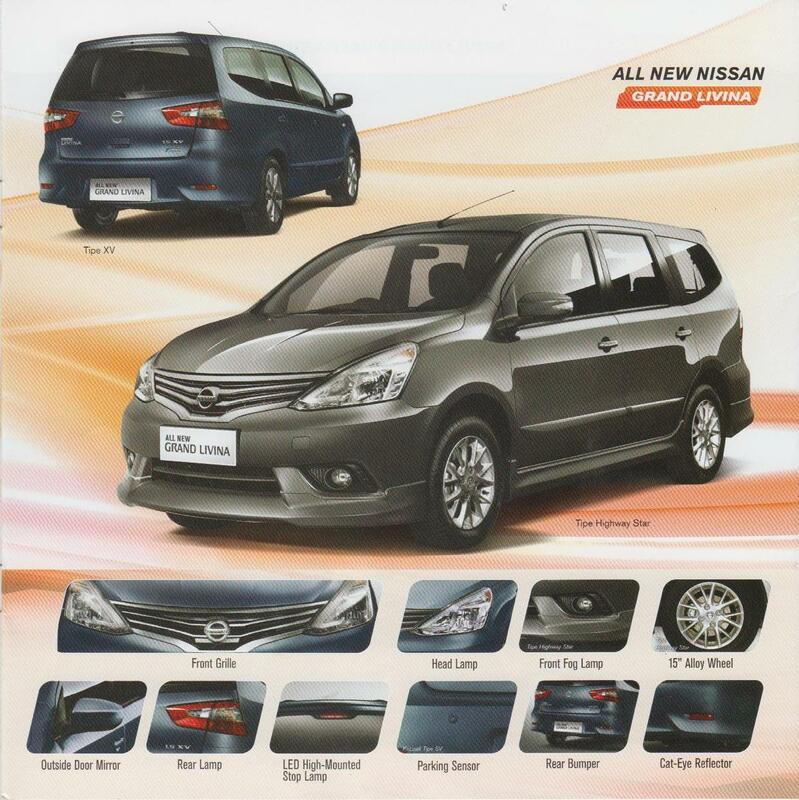 For more Information about Nissan, Sales, Pricelist and Dealer or Showroom, please call our Sales Marketing in the number above this article.